The 9/11 Survivor Tree, at the 9/11 Memorial on Littlefield Grid. 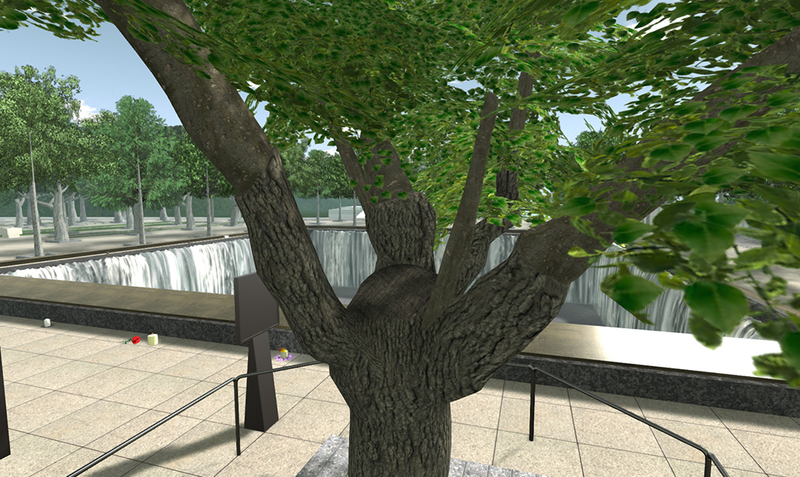 A callery pear tree became known as the “Survivor Tree” after enduring the September 11, 2001 terror attacks at the World Trade Center. In October 2001, the tree was discovered at Ground Zero severely damaged, with snapped roots and burned and broken branches. The tree was removed from the rubble and placed in the care of the New York City Department of Parks and Recreation. After its recovery and rehabilitation, the tree was returned to the Memorial in 2010. New, smooth limbs extended from the gnarled stumps, creating a visible demarcation between the tree’s past and present. Today, the tree stands as a living reminder of resilience, survival and rebirth. Our reproduction of the Survivor Tree was modeled on the original, by Ada Wong, who has beautifully captured the difference in the old and new growth, and even the saw marks where the damaged limbs were removed.